Welcome to the University of Mars! The University of Mars (UMars) is the only University on Mars. The institution began life as an amalgamation of the Mars Deep Mining Training College (MDM-TC) at Viking One Dome Complex and the Non-Mining Technical College (N-MTC) of Mars at Viking Two Dome Complex. UMa rs now comprises a number of constituent University Colleges situated in the most populous Domes, each of which offers a wide variety of courses and degrees and carries out a large body of research. The original MDM-TC is now known as Viking One College and is still the dominant centre for skills related to the mining industry. The N-MTC is now known as Viking Two College and offers a wide range of academic courses. Also in the northern hemisphere, you can choose to study at the larger constituent Colleges of Pathfinder, Phoenix, Opportunity or Beagle. In the southern hemisphere, our constituent Colleges include Mer Spirit, Mars Six, Mars Three, Mars Two, Lowell and of course Wells, in the polar region. 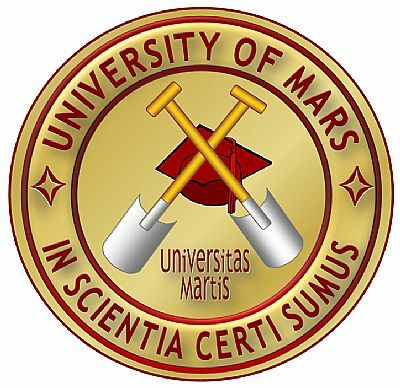 The badge shown above is a generic one of the University of Mars, showing the familiar Crest. You can see the badges of many of the UMars Colleges HERE... and examples of College Certificates HERE... For lots more badges and pictures, click on the Flickr icon (two dots) at the bottom of the screen!